Potter’s is one of many beach restaurants at Anegada’s Setting Point but it is Mustang Sally’s favourite. 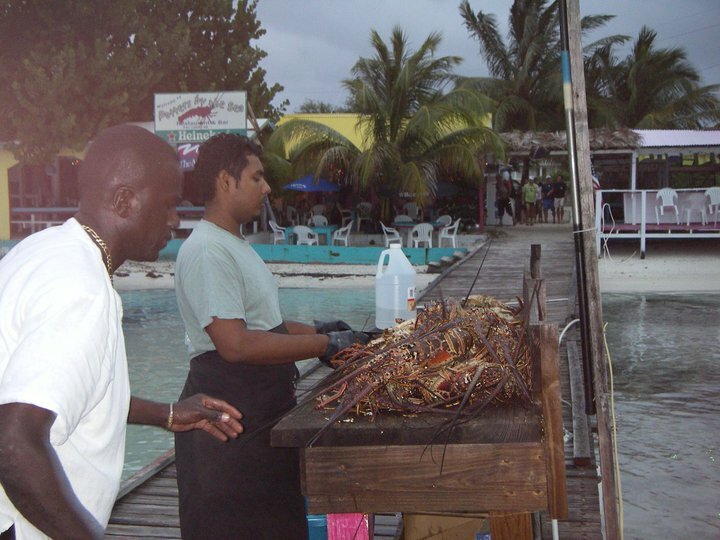 Each week, after a good brisk sail to Anegada, we bring our guests to Potter’s for lobster dinner on the beach. What a great way to cap off a day (or start your night!) with your feet in the sand, a warm breeze caressing your face, the ocean waves gently breaking on the beach, tender lobster and melted butter (yum! ), and a cold drink to sip on. Potter’s brightly coloured, cheerful building right on the water has a good dinghy dock and so easy access to the restaurant and bar and all island amenities. They are happy to arrange a taxi to one of the islands beautiful beaches for the afternoon or perhaps you just want to hang out at the bar and shoot the breeze and sip on ice cold beers. That sounds good too. 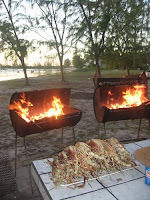 Pick out your lobster and watch “Sam with a capital S” grill your lobster to perfection. Sam “the man with a plan” has the biggest smile and will serenade you loudly (he is not shy!) with song while grilling and still making sure your lobster is tender and moist. If you don’t care for lobster they also serve steak, chicken, ribs and pasta. Vishaal is our adorable good friend who fixes your drinks and likes to make sure everyone has a good time. He always plays “Mustang Sally” on the stereo every time we are there so we can dance. He is the man to take our groups food order over the VHF radio (by 4 p.m. please). Vishaal is also the food prep guy, sometime BBQ man when Sam is away, bartender (best Bushwhacker! ), server and great story teller. Potter’s manages to capture all of the romance and freedom of the Caribbean and it is definitely recommended by Mustang Sally as a “must see”.